I'm the webadmin and an instructor at GFC Muay Thai. So you’re all roaring to go and get yourself fit for 2019, well bring yourself down to GFC for some Muay Thai training. We’re a family run, fun, friendly and most-of-all professional gym with trainers truly involved at the highest levels of combat sports, so if you’re looking for quality training then look no further. New to Muay Thai in 2019? If you’re new to Muay Thai or just want to try something new, then our beginner’s classes on Wednesdays 7pm and Sundays 2pm are perfect for you. We won’t throw you in the deep-end, sparring or anything crazy, but you’ll get a good introduction to Thai Boxing and will be guaranteed to get a thorough workout just as you’d expect from a boxing gym. If you’re not sure what to expect, then checkout our FAQ page linked below for further information. If you have a little more experience, then our Monday bag circuit (easily achievable after a few info lessons in basics classes) is superb for blowing the cobwebs off a long holiday or a big weekend! As usual our Tuesday and Thursday classes are set-up for our more experienced boxers who are looking to spar or compete more. We have regular kids classes throughout the week from ages 5 upwards. There’s no pressure for any child to start training, so feel free to come and watch any of our classes first, we have plenty of chairs so you can sit comfortably and see how our regular lot get on before deciding. Muay Thai is a lot of fun, helps build confidence, and helps to get them off the games consoles! As always all of our regular gym timetable can be found on our Training times page linked below. Tagged 2019, Fitness, Kickboxing, Muay Thai, New Year, New Year New You, Opening Times, Thai BoxingLeave a Comment on Happy New Year to all! Our last class of 2018 will be Thursday 20th December. So make sure you make the most of the year and earn those extra Christmas & New Year drinks by turning up as much as you can before then! Note there’s no Sunday class on the 23rd. Our first class in January will be Wednesday 2nd January with Adam. All adults welcome, so if you want to start your New year how you mean to carry on, you know where to start! 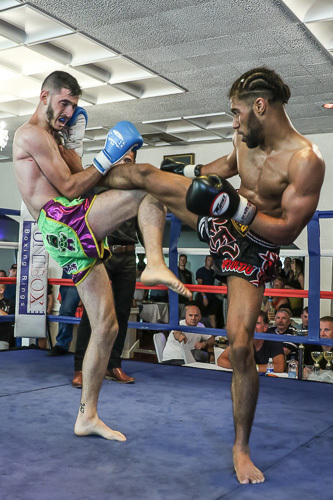 GFC Fighters set to fight on Europe’s biggest Muay Thai show! GFC Fighters Kieran Lee, Myk Estlick and Adam Haslam all fought on the latest Yokkao show at the Macron Stadium on October 13th. On 13th October three GFC fighters featured on the biggest Thai Boxing show in Europe. Held at the Macron Stadium in Bolton, Yokkoa is widely regarded as the best show to fight on in the UK. First up was Kieran Lee, who had been out of the ring for over two years. Kieran’s opponent had three times the amount of fights that Kieran has had and had picked up a couple of titles recently, so all in all, a big ask for Kieran. Kieran however was unfazed and consistently outscored his opponent throughout the fight and despite a late rally managed to hold out for a convincing points win. Second up was Myk Estlick who had featured on all the previous UK Yokkoa shows bar one. His opponent, Niall McGreevy is widely tipped as the next big thing from Ireland and had just returned from six months training in Thailand. Myk is very tall for the weight but his opponent was a god three/four inches taller than him and the fight proved to be very awkward. Myk shipped a couple of low blows early on and this seemed to effect his composure. Myk lost the fights on points. Last up for GFC was Adam Haslam. Most people were picking his opponent, the very talented Luke Hill from Lumpinee Crawley. Adam wasted no time in setting his stall out and went straight out on the attack, landing big blows straight from the off. Round two continued in the same way, with Adam pushing his opponent on to the back foot and scoring well throughout the round. Luke showed his class by coming back in round three taking the round, round four went backward and forwards with Adam just taking it. Then in the final round Adam landed a big elbow in the first minute which opened an horrendous cut over Luke’s left eye. Adam won the fight round to take a convincing and highly enjoyable victory. Kieran and Adam are all ready booked to feature on the next Yokkoa show to be held in March 2019. Leave a Comment on GFC Fighters set to fight on Europe’s biggest Muay Thai show! 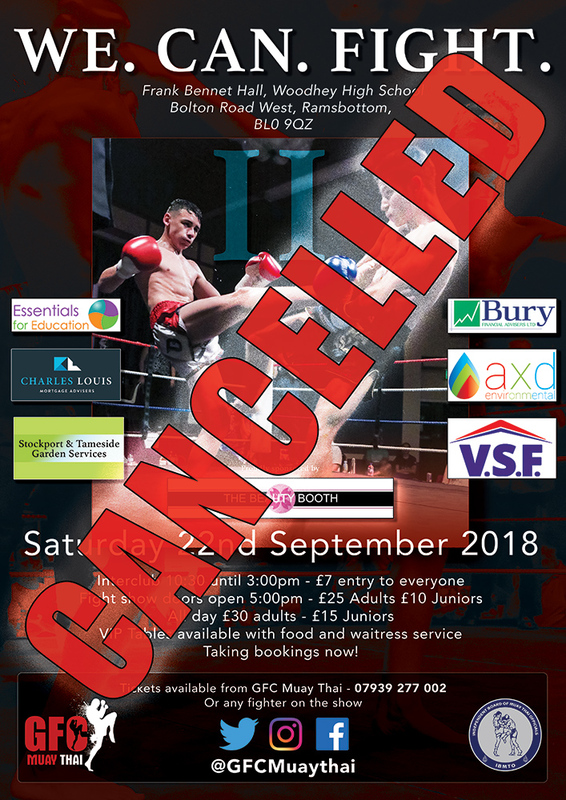 We had an amazing night of fights planned, but unfortunately we had to cancel our show due to lots of fighter injuries and opponent pull-outs. Obviously not the best outcome, but we will come back stronger and have another show planned for next year! A triumphant return to promoting for us, last week when we hosted our own fight show at the Masonic Hall in Ashton, inviting some of the best fighters from Spain to take on our own champions. We never shy away from testing ourselves. Our Awesome videographer Kevin Gaffney put together an amazing highlight reel of the day, check it out! Leave a Comment on We can fight!